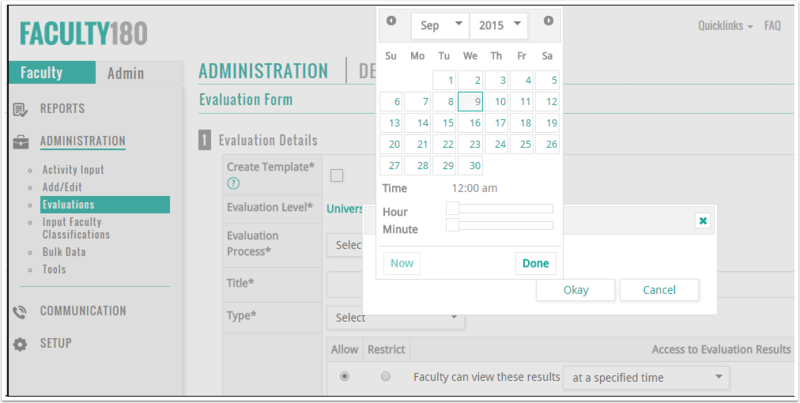 Administrators can now specify a date and time for when faculty can have access to their evaluation results. On the Admin menu, click Administration, then click Evaluations. In the Evaluations section, click Evaluations. The Evaluations screen displays. Select an existing evaluation, or click Add to create a new evaluation. In the Access to Results section, if faculty are allowed access to results, click the drop-down arrow, then click at a specified time. A calendar displays. Specify the date and time when faculty can have access to their evaluations. When you are finished, click Done. A warning message now displays upon clicking the Delete icon when deleting an Activity Input Form in the Setup – Form Configurationscreen. This will help prevent accidental deletion of Activity Input Forms. The evaluation type, unit name, and the names of faculty members under review now display in the Perform Evaluations section of the Evaluations screen. This assists evaluators in determining which evaluation to select. On the Faculty menu, click Perform Evaluations in the Evaluations section. Administrators can now view all evaluation processes that are associated with their assigned units. Select the desired unit. The Evaluation Process drop-down list displays all evaluation processes associated with the selected unit. Administrators now have the ability to create custom Dashboard announcements for their institution. The announcements display in the Announcements section on the FACULTY180 Dashboard, below the FACULTY180 announcements. Examples of announcements are upcoming events and deadlines, and links to training documents. In the School section, click Details. Type the announcement and apply any desired formatting. Note that images and hyperlinks to URLs can also be included in the announcement.